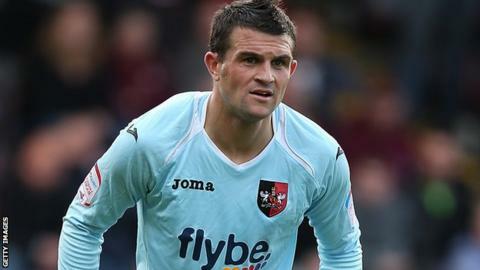 Exeter City right-back Steve Tully has said he and his team-mates have to improve their defending. The 32-year-old, who are 11th in League Two, says the club have got to stop conceding sloppy goals if they are end their recent run of poor form. "We need to buck our ideas up really, there's been a few home truths told this week," Tully told BBC South West Sport ahead of the FA Cup tie at Bury. "It's basic stuff and we haven't done that." City have taken just four points from a possible 24 and have lost six of their last eight matches. And Tully, who is the club's longest-serving player, says it is more frustrating because the team have been performing well. "We're playing well as a team, but we're conceding soft goals or set piece goals, and to be fair, we've never done that," he added. "When you play well, like the first half on Saturday, the lads came off at half-time really happy with how they played. "But we went out in the second half and conceded two soft goals which never helps, and you're always chasing the game." City face a Bury side who have knocked them out of the Cup at Gigg Lane twice since 2007, but Tully hopes that Exeter can get a win to kick-start their season. "This time we want to go up there and get a result," he said. "Yes we have a disappointing run of late, but we want to literally start our season off again, and if we can get a win we could be up and running. "If we eradicate those mistakes, then the way we play, we'll get on top of teams. "We've had a dip in form, every team goes through it, we're hopefully over ours now."